The White House made it almost four hours Tuesday night after the firing of James Comey before its communications staff began demanding an end to the FBI’s Russia investigation. “There is no ‘there’ there,” she said. “It’s time to move on.” Sanders was referring, of course, to the criminal investigation overseen by Comey—at least until he was abruptly fired by the president—which is largely focused on the often suspiciously undeclared financial ties between campaign staff and the Russian government. Around the same time, CNN broke the news that federal prosecutors had issued a grand jury subpoena for the business records of Michael Flynn, the former national security advisor, who was also fired by Trump. The retired three-star general, a chief advisor to Trump’s presidential campaign, is also being investigated by the Pentagon for failing to disclose tens of thousands of dollars he received from a Russia state-owned media company—on its face, a constitutional violation. Sally Yates, the former acting attorney general—also fired by Trump—testified before a Senate hearing on Monday that Flynn misled the FBI about his contacts with a Russian official in December 2016. On CNN, Presidential counselor Kellyanne Conway became (probably) the first administration official in at least 40 years to blurt out the phrase “cover up” on national television in reference to their own White House. (She was denying there was one.) Conway was previously banned from the network after she fabricated a massacre on live television. “I know that some are obsessed with the word Russia — the president is not under investigation, I’m around the president, I’m not under investigation,” said Conway, adding that she knows “many people” who aren’t under investigation. And Sean Spicer, the press secretary, who apparently locked himself in his West Wing office at one point Tuesday night after shouting a statement to reporters, refused to appear on camera. He later apparently hid behind some bushes outside the White House, refusing to reveal himself until after the scrum of reporters turned off their cameras. “Just turn the lights off. Turn the lights off,” he ordered, according to the Washington Post. He insisted the White House had no involvement in the assessments of top DOJ officials who wanted Comey gone. 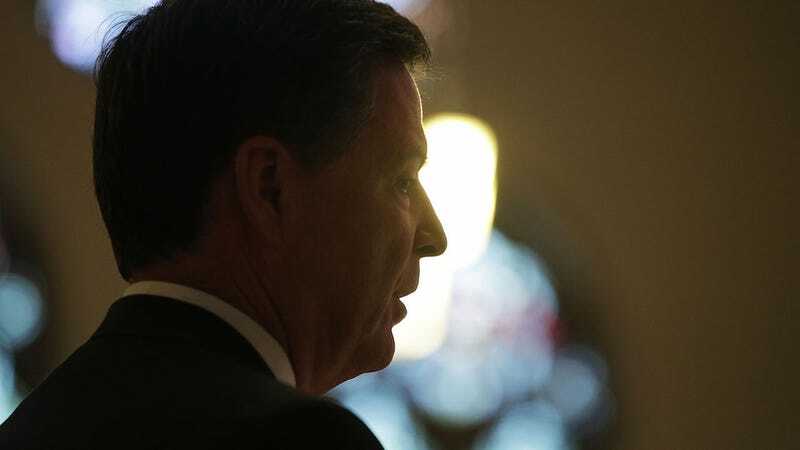 The New York Times reported, however, that the president had been contemplating getting rid of Comey for weeks, unhappy with how the director had failed to defend his dubious “wiretapping” tweets, incensed that he’d revealed that Trump’s campaign was a key focus of the FBI’s inquiries. Trump would often “scream at television clips about the probe,” wrote Politico, citing a presidential advisor. Two months ago, Attorney General Jeff Sessions formally recused himself from all matters related to Russia’s role in the election. That announcement came after it was revealed that he’d chosen not to disclose two meetings with the Russian ambassador during his confirmation hearings. Still, the president cited his advice as well in purging Comey. The White House did not afford the former director much dignity, despite his 30 years of public service: While addressing a group of FBI employees at a “diversity and recruiting” event in Los Angeles, news of his dismissal reportedly flashed across a set of TV screens behind him. A speech that he was set to deliver that evening was promptly cancelled. News helicopters tracked his SUV as it approached Los Angeles International Airport, where he boarded a jet bound for the nation’s capitol.